We all think that in order to buy a smartphone with decent functionality we have to have at least INR 12000-15,000 in our pocket, but what if you get a smartphone with a good camera, awesome display and enough memory below INR 5,000? 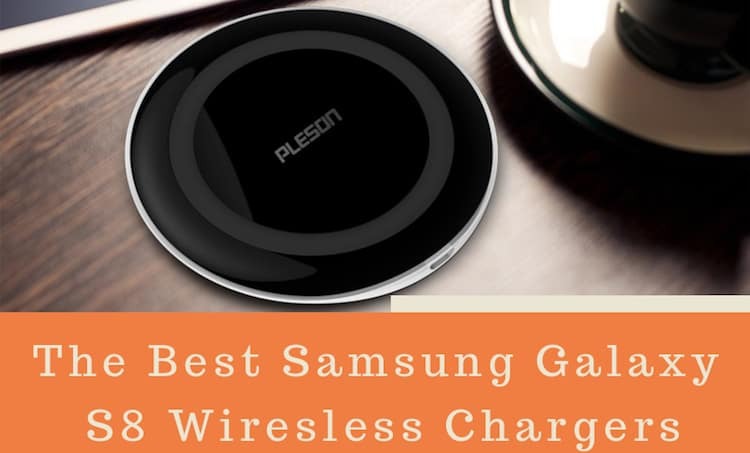 You may not believe, but Samsung has made it possible for the masses to buy a budget phone with outstanding capabilities so that a average person can also get the benefits of latest technology. 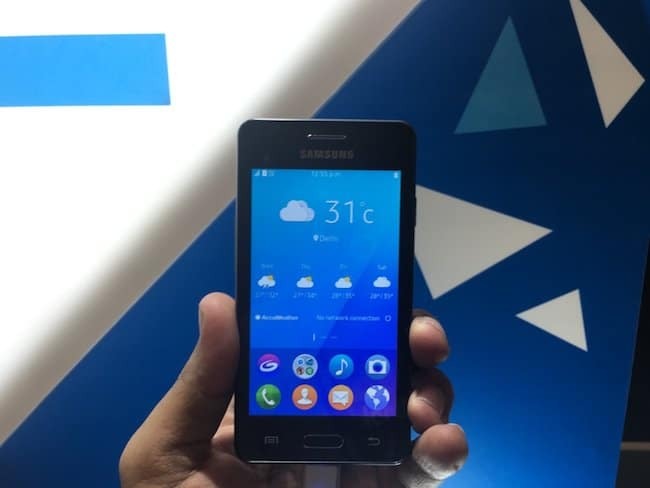 The South Korean electronics giant launched its first 4G LTE accessible and with Tizen OS smartphone, Samsung Z2 on August 23, 2016 in New Delhi, India. The company claims that the phone has been manufactured in Bengaluru by its research and development team. Samsung Z2 sports downloads speed of up to 150Mbps and upload speed of up to 50Mbps for 4G Cat.4 along with HD voice calling and VoLTE support. 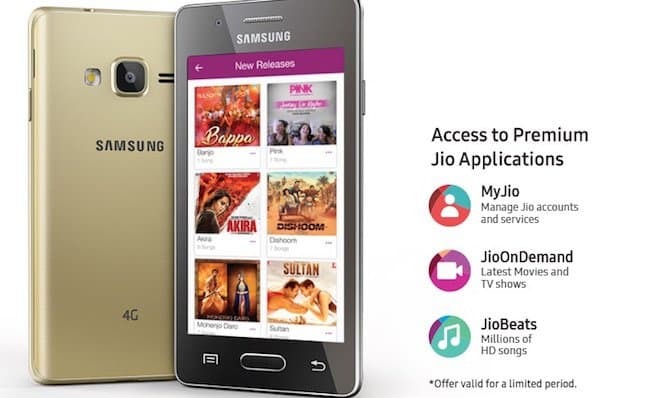 Samsung is also offering Z2 customers a free Jio SIM to get access to Reliance Jio services and avail features like JioOn Demand, video streaming app, Jio Beats, access to the latest movies and many more for 90 days along with unlimited data usage. Samsung Z2 also supports 12 regional languages of India and preloaded with My Money Transfer app to enjoy internet free banking. Customers can transfer up to INR 5000 using a distinctive MMID which will be attached to the registered smartphone via M Pin set by the user. The Samsung Z2 brags a respectable design with a glossy finish. The phone is slim and light weighted so can be held easily with a single hand. The dimensions of the phone are 121.5 x 63 x 10.8mm. It boasts a 4 inch WVGA TFT display which is capable of providing clear visual in indoors as well as outdoors. The device ships in three attractive colour variants Gold, Black and Wine Red. Samsung Z2 offers dual SIM facility and has a micro SIM slot to expand the storage capacity of the phone. It also includes Accelerometer sensor which is exceptional in this price segment. The Samsung Z2 is powered by Quad-core 1.5 GHz processor coupled with 1GB RAM to make sure smooth performance and fast output. 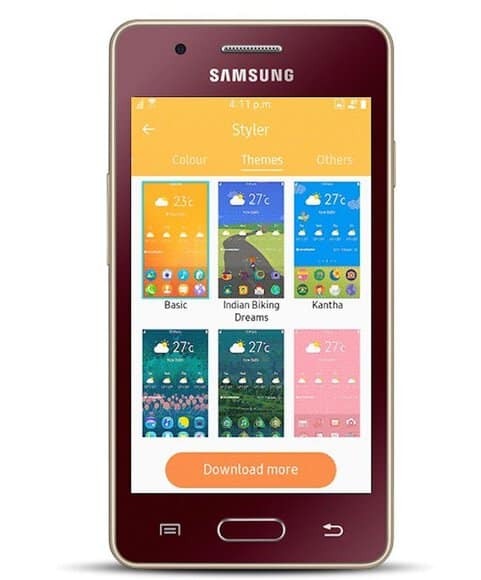 It offers 8GB of memory which few users may not find sufficient because the actual memory to use is lesser due to the space occupied by the OS and in-built apps, but the phone supports memory expansion up to 128GB through a micros SD card. 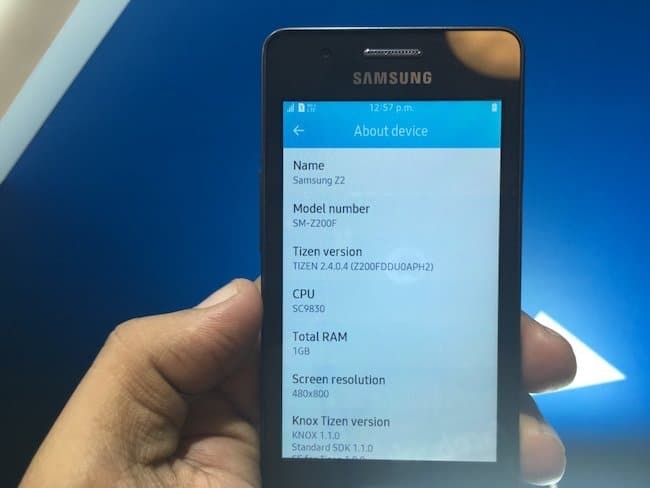 The phone runs on Tizen OS, which is junk free, easy to use and highly instructive interface. The audio and video playback quality of the phone is also remarkable and it supports various formats and codecs. The phone boasts various user modes such as The Ultra Data Saving mode, which blocks unwanted apps running in the background and saves upto 40% of mobile data. It also includes a useful S bike mode to give convenience to the two-wheeler users and make sure their safety while traveling. Considering that the price of the phone is very low, the camera quality of the Samsung Z2 is satisfactory. It comes with a 5MP rear camera with f2.2 aperture and LED flash which allows users to take bright pictures in dark environment. The phone also packs a 0.3 MP VGA front camera with f2.4 aperture. You can shoot HD videos at 30 frames per second in MP4 or 3GP format. The colour saturation of the rear camera is pretty well. It offers various camera modes and features to enhance the image quality such as Auto, Panorama, Beauty Face, Interval Shot, Fast Motion, Night, Pro, Selfie and Wide Selfie. The Samsung Z2 is fuelled by a powerful 1500 mAh battery which can last up to 8 hours while browsing 4G connection. The phone also provides support for USB on the go. For Wireless connectivity it has Wi-Fi 802.11 b/g/n 2.4GHz and Wi-Fi Direct. Other connectivity options include Bluetooth 4.0, GPS, Glonass and USB 2.0. Samsung Z2 is priced at INR 4590 in India and will be available August 29, 2016 across mobile phone retail stores. 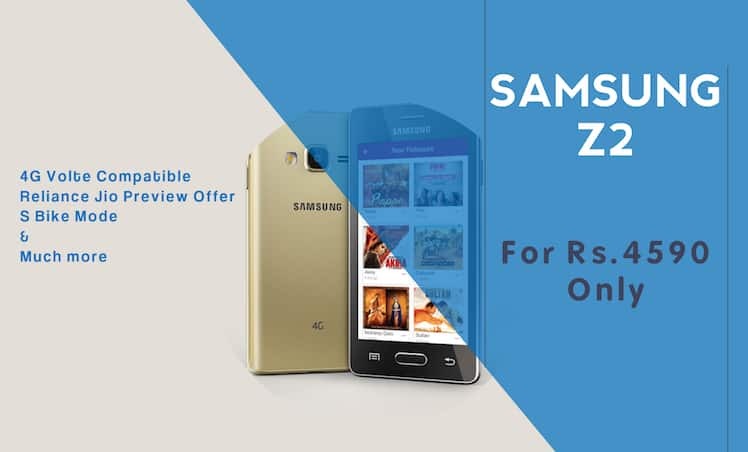 Samsung Z2 is also available exclusively through Paytm and Samsung offline stores. Although, many companies have reduced costs and have introduced some of their models at a very decent price, but still no popular brand has reached up to this limit. 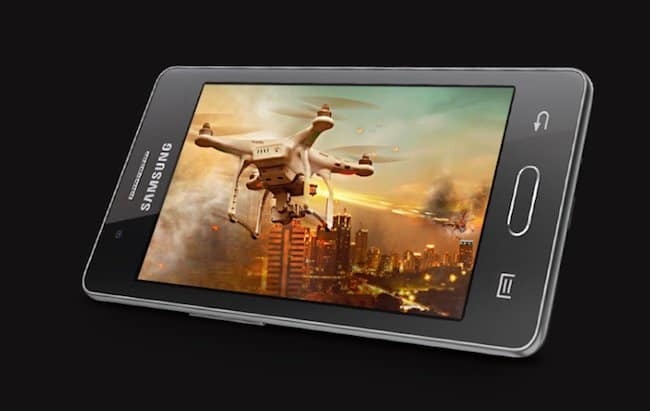 Z2 has a brand value of Samsung and phone offers easy to use deal with satisfactory display. Not only that, Reliance Jio preview offer will attract many of the Indian consumers to buy this phone over Lyf smartphones because of brand value and reliable service centres of Samsung. There is a possibility that it may storm the market in the next couple of months. We are also eager to see how Indian consumers respond to it.